The US Mint will produce America the Beautiful Silver Bullion Coins™ until at least 2021. Many casual collectors around the country may have noticed that there are new circulating America the Beautiful Quarters® in their pocket-change that feature reverse designs emblematic of sites of national interest from around the United States. What they may not be aware of, however, is that the US Mint also started producing these massive five ounce silver bullion coins in 2010 that share the same basic imagery as the quarters. Both series of coins were originally authorized by the America’s Beautiful National Parks Quarter Dollar Coin Act of 2008, or Public Law 110-456. The act sought to continue the popularity seen for the previous 50-State Quarters series and its follow-up, the District of Columbia and U.S. Territories Quarters Program. The state quarters program saw intense interest from the public and resulted in many new coin collections centered around the new quarter-dollars. Accordingly, Congress used the successful formula of the previous series to create new "America the Beautiful Quarters" featuring an obverse portrait of George Washington and a reverse design showcasing locations found through the United States. 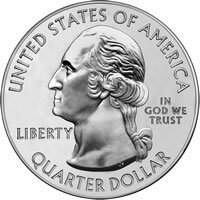 Expanding on that proven plan, Congress also mandated the creation of large silver bullion coins that were required to use those same quarter designs. The new bullion coins are quite different from the America the Beautiful Quarters in several respects, however. First, the size of each new America the Beautiful Silver Bullion Coin would dwarf that of the quarters. The bullion coins have a diameter of three inches whereas the quarter dollar only has a diameter of 0.955 inches. Second, the composition of five ounces of .999 fine silver would give these strikes an intrinsic melt value not seen in the clad quarter dollars. Third, as the obverse and reverse designs of the bullion coins were originally required to be identical to that of the quarters, the Mint was directed to place an edge inscription on each bullion piece indicating its fineness and weight. Quarter dollars do not have an edge inscription and instead feature a reeded edge. Finally, as bullion products, these five ounce silver coins are sold through the United States Mint’s network of authorized purchasers instead of directly to the public. The US Mint uses this network for all of its bullion coins. The network purchases them in bulk from the US Mint, then resells them in smaller lots to coin dealers and individuals for a small premium above the current spot price of the precious metals contained within them. With a general plan in place, the Secretary of the Treasury was free (with the help of the US Mint and the chief executive of each host jurisdiction) to choose a list of national sites that were to be honored in the programs. One site was to be selected from each state, the District of Columbia and the five U.S. territories, for a total of fifty-six locations to be honored at a rate of five per year. Once chosen, the release dates for the coins would be dictated by the order in which the honored sites came under the direct control of the federal government.